1969-1970 Door Pull Strap Chrome Covers Price each. If you have any questions, feel free to contact us at johnscougars@gmail.com or call John at 616-396-0390. This is the Glue that is specially made for headliner material + the installation instructions. UPHIK-1 Upholstery Installation Kit. This is a set of hog rings & pliers to put the upholstery onto your seats. 1969-1970 REPRODUCTION DOOR PULL STRAP CHROME COVER PRICE EACH. 1967-1968 UNDER TRUNK MAT INSULATION (COVERS GAS TANK ONLY) Easy to install insulation lowers the decibel level inside the passenger compartment while at the same time increases heating & cooling efficiency. Made of thick 70% asphalt/30% polymer, each section is cut to fit a particular area of your COUGAR. Due to the weight of this material, IT IS NECESSARY FOR US TO ADD $3.00 EXTRA SHIPPING CHARGES PER INSULATION PIECE. MADE IN USA!! 1969-1970 UNDER TRUNK MAT INSULATION COVERS GAS TANK ONLY COUPE OR CONVERTIBLE Easy to install insulation lowers the decibel level inside the passenger compartment while at the same time increases heating & cooling effiency. Made of thick 70% asphalt/30% polymer, each section is cut to fit a particular area of your COUGAR. 1967-1968 UNDER REAR SEAT INSULATION Easy to install insulation lowers the decibel level inside the passenger compartment while at the same time increases heating & cooling efficiency. Made of thick 70% asphalt/30% polymer, each section is cut to fit a particular area of your COUGAR. Carpeting will actually fit better after the insulation is installed because the carpets are made to allow for 1/4" underlay. Due to the weight of this material, IT IS NECESSARY FOR US TO ADD $3.00 EXTRA SHIPPING CHARGES PER INSULATION PIECE. MADE IN USA!! 1969-1970 UNDER REAR SEAT INTO TRUNK INSULATION COUPE OR CONVERTIBLE Easy to install insulation lowers the decibel level inside the passenger compartment while at the same time increases heating & cooling efficiency. Made of thick 70% asphalt/30% polymer, each section is cut to fit a particular area of your COUGAR. Carpeting will actually fit better after the insulation is installed because the carpets are made to allow for 1/4" underlay. 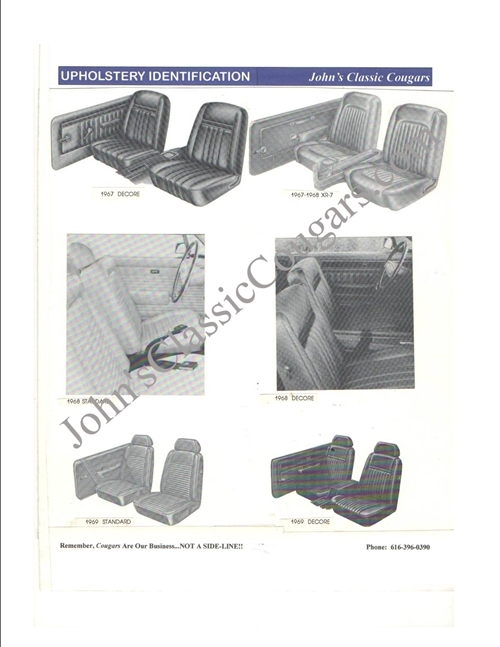 1971-1973 UNDER REAR SEAT INSULATION COUPE OR CONVERTIBLE Easy to install insulation lowers the decibel level inside the passenger compartment while at the same time increases heating & cooling effiency. Made of thick 70% asphalt/30% polymer, each section is cut to fit a particular area of your COUGAR. 1967-1968 UNDER REAR SEAT INSULATION COUPE OR CONVERTIBLE Easy to install insulation lowers the decibel level inside the passenger compartment while at the same time increases heating & cooling effiency. Made of thick 70% asphalt/30% polymer, each section is cut to fit a particular area of your COUGAR.